Sometimes the best method for learning is observing people who are already successful! 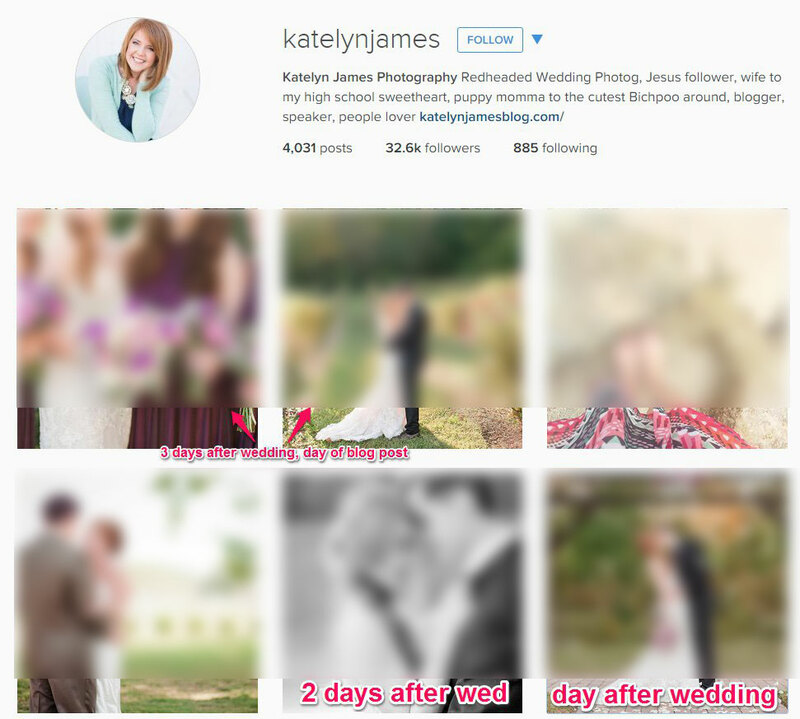 Today, I’m going to observe the process of a very successful wedding photographer, Katelyn James! QUICK NOTE: I took screenshots from public social media profiles, but I did blur the photos because this is someone’s real wedding. I know they didn’t sign up to be on a marketing website and I don’t have permission to use the photos. If you do visit any of the links to the live posts, please be respectful with any comments you leave this beautiful couple! Remember, as photographers we do have a responsibility to market our businesses, but our number one responsibility is to our clients! This particular breakdown is for a wedding that happened on October 10th. This is October 13th. 3 days later. If you don’t take anything else away from this post… let that sink in. Timing is everything in social media and online marketing. So here are the steps. Here are all the posts I can see for this couples wedding and my observations about each part of the process! And the next day. And the next day. Then one more time on that day. 😉 Make sure to mix in personal/other posts. Every post Katelyn makes here tells a story! Pay attention to her stories. She doesn’t just mindlessly throw up a photo, she proves that she knows and cares about the process, and her clients! The URL contains keywords that people might actually search for if they are getting married at this venue in the fall. I counted almost 160 images in this post. 4 solid paragraphs of text in the beginning, and storytelling text throughout. Image file names and alt text contain same keywords as title. This COULD be overkill because they aren’t unique… hard to say if this hurts or helps her. Ideally they would be unique, but done is better than perfect! Did I mention this is THREE DAYS after the wedding? Katelyn makes sure to get these vendor’s information in a client questionnaire that she sends out 8 weeks before the wedding. You can download it for free… Also look at those last 3 links! View other weddings from that venue, view other weddings from this year, and view this couple’s engagement photos. This is brilliant! She is carefully thinking about what her visitors might be looking for. If a potential bride came to her site using the search term that she is optimizing for (Running Hare Vineyard Fall Wedding), that person will probably want to see more weddings from that venue! If you found the site another way and aren’t getting married at this venue, but are a potential bride, you might want to see more recent work. If you’re a family member or friend of the couple in this post, you might also want to see their engagement photos. Always be thinking about how to add the most value to the people you are wanting to visit your site. Tag the venue in the location field (don’t use this for tricky stuff… use it as intended). I noticed Katelyn seems to be using Buffer to manage this. You could also link to the Facebook Page post instead of directly to the blog post. Or you could post an image and link to the blog post and the Facebook page. Or you could just have your Instagram announcement automatically post to your personal profile, then post a comment with a link to the blog post. Anyway, the point is… make a post on your personal Facebook profile! When she first posted this, it was 4 photos posted as an ALBUM. She tagged the clients in the photos, so it included their names in the “with” section. She also tagged the venue as the location. The call to action here is obvious. View MORE on the blog. Of course everyone will flip through these photos and then want to see more, so this link is going to drive SO MUCH TRAFFIC to her blog post. She also posts all of her other social media profiles here. Personally, I don’t love this idea because it gives people too many options for things to click. One link (to the blog) would be perfect! However, it is a good way to increase following on multiple platforms. This is one for personal taste (and of course, testing)! Super important to know who you worked with so you can make sure to mention them on Social Media! Photographers get so much credit because they own all the beautiful photos. Make sure to spread the love and help everyone get the credit they deserve for making the wedding beautiful! Looks like she is using Buffer again here, and each post gets its own unique shortened link, which is trackable. Even if you’re not using Buffer, you can make trackable shortened links with something like Bitly. All of these links go to the same blog post. Over the course of about 7 hours, she has posted 5 times to Twitter. Not sure how to come up with that many unique ways to post the same content? Here are some awesome ideas. This keeps the album fresh at the top of your timeline, and gives it a chance to create a new notification in someone else’s newsfeed. 9. Reply To Every Comment!!! This is SOCIAL Media after all! If you want engagement, then be greatful for the engagement you get and respect the people as humans, not just numbers! This one is GOLD. Each of those page owners should get a notification that they’ve been mentioned, and they’ll come check out the photos. 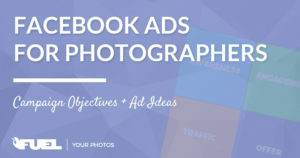 If they love the photos, they may share the album on their Facebook page, and it’ll get that much more interaction! You’ll be reaching the perfect audience… all the people who follow other wedding professionals in your area. Its like they are working for you promoting your brand! Want to ask questions, make observations, and dig even deeper? 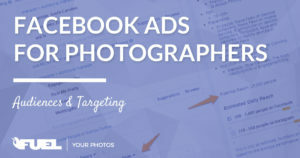 Join the Fuel Your Photos Facebook Group! Thanks for posting this! SOO helpful! Um. Yeah. Its amazing how consistent she is! Woah! Thank you for sharing all of this, this is an amazing guide and I will definitely be referring back to this! You are welcome! I’m going to be working on more soon! time to step up my game haha! GREAT info..glad to know I am doing some things right but there is SO much more I can do! Its crazy how I feel like I can know so much information about how to do social media, yet still learn SO much just by watching people who are successful! Always room to learn, grow and improve! This is a great dissection of Katelyn James. She nails social media. This is full of great information! Very nice!! Great timing! Will be using some of these tools soon! Jasmine Star also does something similar to this with her marketing, and she’s quite successful at it. Yep, I’m planning to look closer at Jasmine Star soon! I know Jasmine was a huge influence on Katelyn back in the day. She’s like one of the original photo blog queens. I remember back in the day when she and Jessica Claire were first using a blog as their main website… it was revolutionary at the time! Her workflow is the stuff dreams are made of! Haha, so true… pretty sure I dream about workflows like this too! lol. Amen! I try to preach consistency, but sometimes its hard for me to even practice what I preach. Thanks for being that example of what happens when you follow through and put in the hard work to stay consistent! Thank you so much for this post! Very helpful. These are some great tips! Thank you for breaking this down into simple steps. Thank you for this! I love her and she is an amazing photographer and consistent business owner.